Britain has more job vacancies than can be filled by the native workforce. That, in a nutshell, is why we need migrants. The country has a chronic skills shortage and without migrants helping to fill that gap, Britain – and Britons – would be poorer. Britain now has more people at work than ever before. We also have a record number of job openings – around 750,000 vacancies in August alone. It’s no wonder that in line with that, immigration from the rest of Europe is also at a record high. Why? 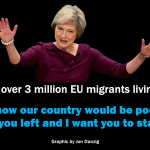 Because migrants mostly come to Britain for jobs, and if there were not so many jobs, there would be little reason to come here, and therefore, not so many migrants. Of course, none of this is any consolation to the 1.77 million people currently unemployed. But unfortunately, many of the unemployed do not have the skills now needed by employers. Britain, of course, should be spending billions in upskilling our workers, and especially the unemployed. Similarly, we shouldn’t blame migrants that parts of the country lack sufficient schools, hospitals, homes, or that many are struggling on zero-hour contracts. For that, we should blame our political masters. 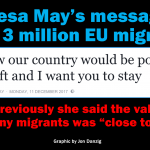 It’s too easy for the government to scapegoat migrants for our problems, when the fact is that without migrants, the country would be poorer. If all migrants went home, we wouldn’t have more schools, hospitals and homes. We would simply have a bigger shortage of teachers, doctors, nurses and builders. In the meantime, British businesses are hungry for more skilled workers. Without them, our economy would stagnate and die. That, actually, is one way to stem the flow of migration to Britain – to trash our economy. But who would seriously advocate such a policy? The fact that Britain now has record numbers at work, record numbers of vacancies, and unemployment at a 7-year-low of 5.4%, is a sure sign that the country is steadily climbing out of its economic downturn. And helping to propel that recovery are migrants, most of whom are in gainful employment, working hard, paying taxes and spending most of their earnings here, in Britain. And yet, Britain still doesn’t have enough workers to fill the profound skills gap the country is facing. Yes, of course, we should be training more people. Scientists, such as geologists; nuclear medicine experts; mechanical engineers, such as for the oil and gas industries; electronic engineers for the motoring industry; software developers for 2D/3D animation; contaminated land specialists; medical practitioners, such as psychiatrists, anaesthetics and radiographers; specialist intensive care nurses; maths and science teachers; social workers; contemporary dancers; orchestral musicians; overhead lines workers; skilled chefs..
..And the list goes on and on. Skilled workers that the country needs now. In addition, many farms, catering establishments, hotels, care homes and builders categorically state that they simply could not survive, let alone thrive, without EU migrants. Not because they are cheaper (can you really find a cheap Polish plumber these days?). No. It’s because these establishments have more vacancies to fill than British people either can or want to fill. Eurosceptics say they are not against migration, but want the country to have fewer migrants, and to be able to choose who can come here, based on the skills needed. And they don’t want EU migrants to come here unless they have a job in advance. But that just creates another bureaucratic barrier to EU migrants coming here at all. And in any event, the country already does choose which migrants to employ – the decision is made by British businesses, who want the right to choose their workforce from across our continent. If an EU migrant can’t come here without having a job first, then chances are they will go to another country, and help their economy instead. That will be our loss. 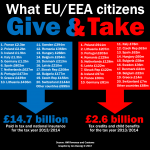 EU regulations state that any EU citizen can move to another EU country to seek a job, so long as they have the means to look after themselves and don’t become a burden to the state. And what’s wrong with that? If they come here and don’t find a job, they usually go back home. It’s a Daily Mail myth that migrants can simply come here and immediately start claiming benefits. It simply isn’t true. The fact is that most migrants here have jobs; jobs that British businesses desperately need them to do. Britons shouldn’t complain – especially since more Britons are now in work than ever before. Migrants are not taking the jobs our unemployed could do. Migrants are coming here mostly to do the jobs that Britons can’t all do. *Join the discussion about this article on Facebook. This entry was posted in Current Affairs, Democracy & Citizenship, Economics & Trade, Global & International, Law & Justice, Politics & Public Policy, Science & Technology, Society & Culture, Teaching & Learning, The EU and tagged economic migrants, employment, European Union, migrants, migration, skills gap, skills shortage, vacancies. Bookmark the permalink. 70% of the electorate of the UK wish to see immigration numbers cut. Over 50% of the electorate wish to see immigration numbers cut drastically. As these people hold the same vote in a referendum as a CEO, or even a journalist, your argument will I am afraid cut little ice. And chucking Danegeld into Africa is hardly likely to alter that. As I am sure you recognise, immigration will dictate the result of the referendum you didn’t want. And your view is losing that argument as the razor wire goes up. Your dreams of a European multi cultural paradise lays dead alongside the citizens of Paris. That in my view is a most awful comment. People of all backgrounds and cultures were victims of the attack in Paris. It’s time for our societies to stand form and resolute, and not let the terrorists win at their plan to divide us. The attacks in Paris were not because we are a multi-cultural society, and to try and make political capital out of a terrible attack on European values is quite frankly reprehensible. There is very little division, we are not divided. Islam is toxic, it pollutes our democracy, it stands against everything we believe in. You represent a tiny minority Jon. It’s mostly Muslims who are the victims of ISIS; it’s mostly Muslims who are fighting ISIS; most Muslims in Britain and the rest of the world are strongly against ISIS and similar terrorist groups; the vast majority of Muslims in Britain are loyal, peaceful, upstanding citizens. Most Muslims in the world are peaceful and compassionate. Most of them choose to interpret their Qur’an as a book that promotes, endorses and compels good will to people. We have to guard against any forms of Islamophobia. This is not a war against Islam; and I believe that we shouldn’t make it one, either. This is a war against religious Islamic extremism that does not represent the beliefs of most followers of Islam. I don’t claim to represent anyone other than myself. There are some who think like you Jon. Thankfully you are a minority. First we will be dealing with the problem that is Islam. Next we will turn our attention on to the enablers, at which point you should consider a life under Sharia, because that is the only place your ilk will be welcomed. Common Purpose filth will not be welcome in the new Europe. And deep down Jon, you know it. Roy Jacobs, you really shouldn’t make your comments so personal, which goes against the ‘rules of engagement’ for this page. I believe that my view – that Islam and most Muslims are not the enemy – is shared by the majority, and certainly by the leaders of democratic countries, including Barrack Obama and David Cameron. “We are not at war with Islam. We are at war with people who have perverted Islam,” said President Obama. “As chancellor, I come to the defence of Muslims, most of whom are upright, constitutionally loyal citizens,” said Angela Merkel, Chancellor of Germany. “ISIS is our enemy and that is why we are at war. We are not at war with a religion or Islam,” said the Dutch Prime Minister, Mark Rutte, today. “We are not facing a fight between Islam and the West, it is not a fight between Muslims and non-Muslims,” said Denmark’s Prime Minister, Helle Thorning-Schmidt. Such views are also my views. They are the views of the democratic leaders of the world; so my views are hardly, as you claim, on the margins of current, mainstream, considered thinking. You don’t represent my views and cannot declare what I know ‘deep down’ My views are transparent and clear, and don’t need to be misinterpreted or misrepresented by you. Divergent views are welcome; but they should not be made personal.